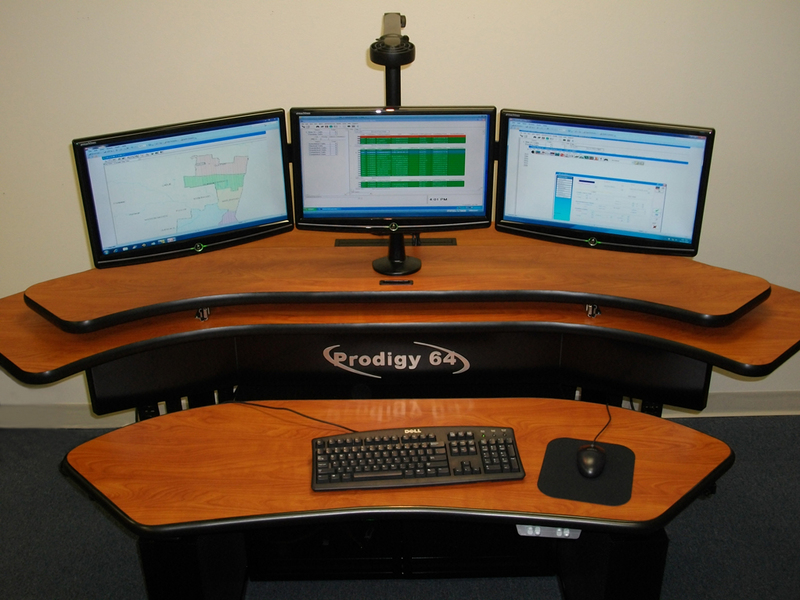 The Prodigy 64 Call Taker Console has been designed to meet and exceed the National Ergonomic Standards. This attractive free standing console offers state-of-the-art features such as “Prodigy Data Management System” and the advanced “Prodigy Personal Comfort System”. What makes it truly unique to this console is that its modular construction is engineered for change. This Call Taker Console has the capacity to support up to four 20” monitors, and can be reconfigured to a full sized Prodigy 76 console that will support up to five 20” monitors, simply by replacing the monitor surface. With this added flexibility you can personalize your furniture console based on today’s needs and reconfigure it in the future should your business requirements change. Selection of modular work surface designs. Supports up to four 20” LCD monitors. Can be modified to reconfigure to the full Prodigy 76 console which supports up to five 20” LCD monitors. Multi-functional keyboard surface. Expansive input surface supports multiple keyboards, mouse devices and phones. The large cockpit shaped input surface improves ergonomic comfort by providing abundant space for daily workflow. Dual height adjustable work surfaces. Fully independent keyboard and monitor surfaces provides height adjustability from ~23” to 50”. Sit-to-stand. One standard electric DC motor provides height adjustability of the monitor and keyboard surfaces from ~23” to 50” which complies with the proposed BSR/HFES 100 Ergonomic draft standard. A four memory position switch pad permits the user to save their preferred height adjustments. Lift speed and weight handling capacity. The independent front and rear standard duty lift system travels a height range of 27” in ~14 seconds and lifts a static load up to 360 lbs. Center or Side CPU storage. The center or side\cabinet holds up to four CPU’s, is vented for cooling by using a mesh skin around the box allowing circulation all the way around the CPU. Technical multi-use side cabinets. Side cabinets can be used for filing, trash, personal storage or CPU storage. They can be placed next to the base or stacked to create a side tower. Cable management. A snake tray and cable troughs eliminate cable stress while maintaining critical bend radius as the console moves from a seated to a standing position. Panel systems are not required for cable management which can significantly lower the cost of your console. Optional Power Distribution Unit (PDU) The PDU provides quick disconnect and reconnect without having to gain access to the cabling below a raised floor. This “future ready” feature will significantly reduce downtime and cost associated to console relocation. 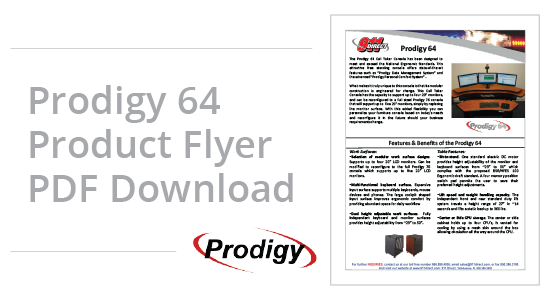 On all Prodigy consoles safety goes into every design and we approve each design with UL. Safety features include protective shrouds that minimize potential pinch points and protect the user. Overload protection on lift motors. Ensures longevity of motors and comes equipped with an automatic reset. Air Circulation. Compact and recessed personal desktop air diffusers offer both horizontal and vertical directional controls providing optimum user comfort without taking up valuable space on the work surface. Circulating heat. A 250W circulating fan forced heater with LCD head up display control, assures personal comfort by providing warmth to the feet and legs. Dashboard control unit. Includes 5-stage fan speed control for filtered air, LCD temperature display with adjustable temperature. Button control and On/off switch for heat, and task light dimmer control. Optional rear access panel system. Rear access pop-out panels (with recessed handles) allows technicians to access the CPU Cabinet from the rear, without interfering with the dispatcher. Variety of panel styles. Allows seated eye contact with other individuals and visual access to projection screens. A variety of glass heights are available which helps minimize “voice bounce”. Customized design/build options. Panels can be built with both tempered glass and fabric sections and configured in multiple heights to provide acoustical and visual benefits. Lighting solutions. Optional dimmable task lighting and indirect lighting can be attached to the console to ensure the lighting can be relocated with little disruption and minimal cost. Indirect lamps provide energy efficiency with 75% up-light and 25% down-light.